RAR file is a file format which is used to compress files and folders so that its size can be reduced. Movie and game files often contain several gigabytes of data and for computer users with a slow Internet, downloading these files takes long time. So many users prefer .rar file format to compress their data in order to send it through internet or to save hard drive space. While RAR file allows users to send information using less data than the full sized original file, the method is not perfect. Often RAR files get corrupted resulting in a loss of precious files that has been compressed in .rar archive. However, many users make use of manual method in order to deal with the corruption of RAR file, but this method does not help you in case there is a severe corruption. At that moment, you may find success after using software named Remo Repair RAR. But before you go further to download this software and start repairing RAR file, let us first have a glance over the situations that lead to corrupt or damaged RAR file on Windows OS. This page provides information about how to fix CRC Error on RAR Archive and recover data from it. Make use of this wonderful utility called Remo Repair RAR to easily fix your severely damaged / corrupt RAR files on your Windows 8 operating system. Do you want to open your damaged RAR archive? Then repair it first with Remo Repair application. Once your damaged RAR file gets fixed, you can easily extract its file contents. Want to know how to access your WinRAR archive which fails to open? Then, just go through this page. How to eliminate WinRAR CRC failed error? Is this question is bothering you? If yes! Then read this page to find out a way to overcome from it. How to Fix WinRAR no Archives Found Error? Simplest and easiest way to repair your WinRAR file after encountering archive not found error message. Make use of Remo Repair RAR tool in order to fix errors that are recieved while using WinRAR files. How to Fix RAR Corrupt Header? Are you searching for a way to fix your broken RAR file header? Then visit this page. Here you will get a suitable software to repair RAR file header. Go through this article to find an easy way to repair your corrupt or damaged RAR archive. How to Fix Partially Downloaded RAR File? Remo Repair RAR is a powerful Windows repair utility, which scans and fixes partially downloaded RAR file effortlessly. Discover one of the most effective methods to open your RAR archive that denies opening as a result of corruption using Remo Repair software. How to Extract Half Downloaded RAR File? How to Open RAR Files on Windows Vista? Remo Repair RAR utility is the most powerful RAR fixing tool to open RAR files on Windows Vista system within few simple mouse clicks. How to Solve CRC Error in WinRAR? Are you facing of CRC error message? Then do go for Remo Repair RAR Utility to solve all problems associated with RAR files effortlessly. Make use of Remo Repair RAR software to easily open corrupt RAR files created by all versions of WinRAR application. It can also fix corrupt or damaged RAR files of large size effortlessly. How to Extract Large RAR Files? Are you searching for good tool that will extract large RAR archives which is corrupted? Then, definitely go for Remo Repair RAR utility to fix RAR archive. Make use of Remo Repair RAR utility will help you in repairing corrupt or damaged RAR files stored in Windows 7 system. How to Open Partial RAR File? Make use of Remo Repair RAR software to open partial RAR archives on Windows Operating system easily within minutes. If you are getting download error when extracting RAR file then do go for Remo Repair RAR tool that will effortlessly fix this errors without any complications. If happens often where the WinRAR refuses to open and keep on saying that the file is corrupted. This issue can be resolved with the help of Remo Repair RAR . Read this page for more info. If you are frequently getting unexpected end of archive error in WinRAR, then do opt for Remo Repair RAR file which will solve every error related to WinRAR. How to Open Corrupted RAR files? If WinRAR application is corrupt and not able to open, then opt for reliable software called Remo Repair Outlook to repair corrupt WinRAR files at ease. In order to extract partial RAR files from Windows system within few simple steps, run efficient software called Remo Repair RAR Windows that provides powerful scanning algorithms. How to Extract RAR Files on Windows 8? Always make use of potent repairing tool like Remo Repair RAR which is highly recommended by software experts to extract RAR files on Windows 8 system in ease. If you want to fix RAR file CRC Error on Windows system to extract the essential files available in it, just go for Remo Repair RAR for best output. By using Remo Repair RAR tool now it’s possible to fix the Archive is either unknown or damaged error without any complications. If you are unable to extract RAR files from your Windows system, then just install and run brilliant application called Remo Repair RAR. 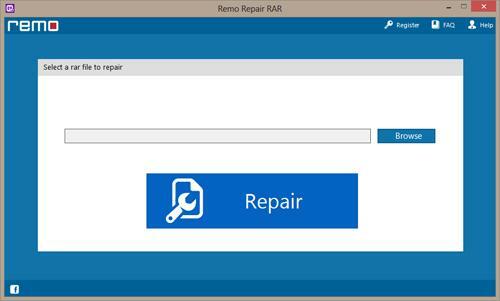 Here is a perfect application called Remo Repair RAR, which is highly suggested by industrial experts to repair RAR on Windows 8.1 within few easy steps. To learn how to deal with can’t extract RAR Files access denied error on your Windows system, utilize Remo Repair RAR that repairs RAR within few simple steps. Here is an amazing repairing tool called Remo Repair RAR with powerful scanning algorithms to repair and extract RAR files Windows 7 64 bit within few simple steps. Are you looking for ideal tool for repairing RAR file on Windows 7? Then opt for Remo Repair RAR that is highly effective to answer how to repair RAR on Win 7. RAR files that have been damaged can be easily repaired using Remo Repair RAR application, which is highly powerful and capable enough to resolve all sorts of issues in .rar file formats. Repair and extract all contents of password protected RAR archive with ease by making use of Remo Repair RAR app. Is your RAR file turned bad? Remo Repair RAR is highly efficient software that helps you in repairing bad RAR files and extracts all stored information from it. Don’t bother, if RAR file is not opening on Windows 8 based computer. Use Remo Repair RAR application as it fixes the files in just few clicks. Do you have an incomplete RAR file with inaccessible data? Stop worrying! Use Remo Repair RAR software to fix and open incomplete RAR file thereby recovering all files and folders. Remo Repair RAR utility is an efficient tool which can be utilized for fixing RAR files showing no files to extract error in an easy way making all data recoverable. Don’t break your head to fix a password protected RAR file. Use Remo Repair - a comprehensive tool to fix all your RAR file problems.